12 Volt NEGATIVE Ground. (Also available in 12 Volt POSITIVE, 6 Volt NEGATIVE and 6 Volt POSITIVE - CALL). For the following models using Autolite IAD-6003, IAD6003-2F and IAD6004 distributors. (VERIFY your distributor for match): VA, VAC, VAE, VAI, VAO, VAS, 150, 200, 200B, 210, 210B, 211B, 300, 302, 310, 320, 350B, 351, 400, 400B, 430, 440, 441, 450, 500, 530, 540, 540C, 541, 541C, 580CK, 600B, 640, 640C, 641, 641C, 650, 655, 675, 1150, 1155, 1255. Electronic Ignition Conversion Kit, replaces points and condenser with an electronic module. Use with 12 volt negative ground system. MUST ALSO REPLACE CAP (part number AL165) and ROTOR (part number AL150) both available from an auto parts store. 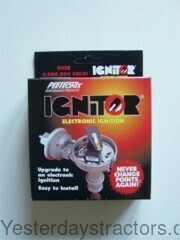 New, aftermarket Electronic Ignition Conversion Kit, 12V Negative Ground for sale with a solid manufacturer warranty. In addition, we have a generous 30-day return policy if this Case Electronic Ignition Conversion Kit, 12V Negative Ground for Case VA, VAC, VAE, VAI, VAO, VAS, 150, 200, 200B, 210, 210B, 211B, 300, 302, 310, 320, 350B, 351, 400, 400B, 430, 440, 441, 450, 500, 530, 540, 540C, 541, 541C, 580CK, 600B, 640, 640C, 641, 641C, 650, 655, 675, 1150, 1155, 1255 tractors needs to be returned for any reason. Please see our Parts Warranty and Return Policy links on your left for complete details before returning.